Over the years, Kish and I have contributed to the campaigns of candidates from both parties. As a result, virtually every day we get fundraising literature from one candidate or another who is looking for a buck. Lately my top pen pal has been Mitt Romney. Say what you will about the guy, but he is persistent. I’d bet that he’s sent me more than a dozen letters — including two big envelopes that enclosed a large photo of Mr. Romney, clad in jeans, hands in hip pockets, smiling face turned skyward, standing in front of a barn with an American flag painted on the side. I’m sure the Romney campaign hopes that it’s the kind of inspiring photo that makes you reflexively reach for your wallet and make foolishly large contributions. Whoa, there, Big Fella! I’ve been voting long enough to reserve judgment on the excellence of a President until after he’s been elected and made some of the hard decisions that are part and parcel of the job. And what’s with this notion of me being “honored” to join Mitt’s team? Even if I were inclined to contribute to Romney’s campaign, I wouldn’t feel “honored” by the opportunity to write a check in response to a mass fundraising appeal. Shouldn’t he be “honored” if I were to decide to make a contribution? 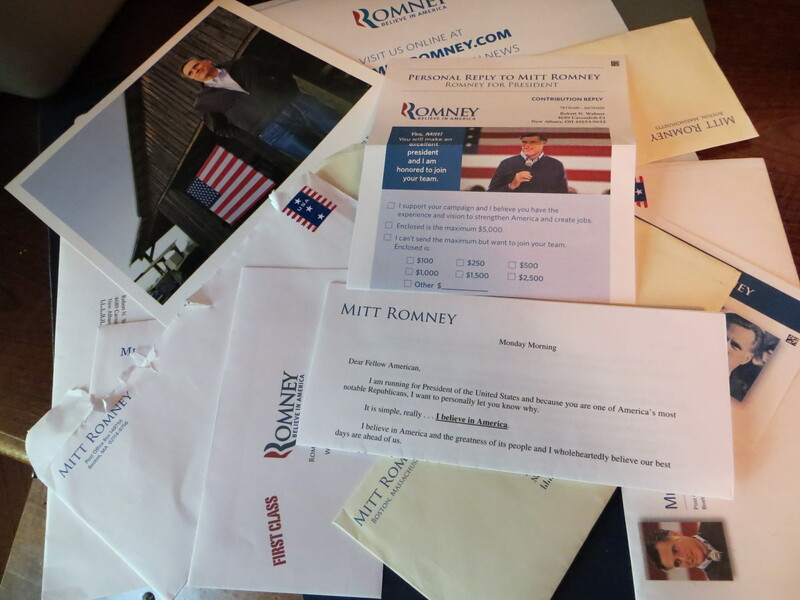 Romney’s fundraising appeals are no more silly or annoying than the letters we’ve received from other politicians, including President Obama. And although they clog our mailbox, at least we can take comfort in the fact that my pen pal’s persistent appeals — all of which are sent with “presorted standard” USA stamps — might help the Postal Service avoid another one of those record deficits. We’ve heard a lot recently about President Obama’s fundraising. One journalist reports that, so far, the President has attended 160 reelection fundraisers — twice as many as President Bush had at the same time in his 2004 re-election bid. I’m not a Polyanna about fundraising. Modern presidential campaigns are crushingly expensive. A President seeking reelection needs to raise lots of money, and no one is going to be a more effective at it than the President himself. The inevitable consequence is that the President will spend a lot of time at fundraisers, hobnobbing with high-rollers and collecting their checks. There’s an unseemliness to the emphasis on cash, cash, cash and the President’s involvement in raising it, but we’re beyond the point of worrying about unseemliness in modern politics. Instead, I’ve been thinking about the impact of constant fundraising on the President’s ability to perform other important parts of his job — such as working with Congress and trying to build the kinds of coalitions needed to pass legislation. 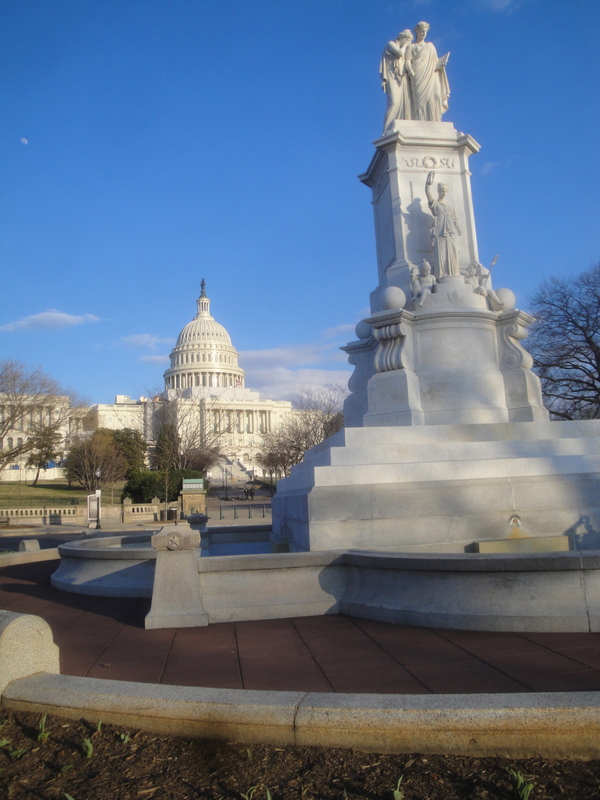 The focus on fundraising interferes with the President’s relations with Congress in at least two ways. First, there are only so many waking hours in the day. Every hour spent on the rubber-chicken circuit is one that could have been spent strategizing with congressional allies, schmoozing opponents, or seeking points of potential compromise on important legislation. What’s more likely to break the stalemate in Congress — another glitzy fundraiser in Hollywood, or a weekend retreat to Camp David with House and Senate leaders, or wavering Members of Congress who might be persuaded to vote for a presidential initiative? Politics is personal, and if a President doesn’t regularly offer the personal touch, he is bound to be less effective in his relations with Congress. Second, the President gives a speech at every fundraiser. What does he typically talk about, to fire up his supporters and spur them to write bigger checks? Why, it’s the “do-nothing” Congress that won’t act on his agenda. So the fundraising grind exacts a dual toll — the President not only is taken away from Washington and the opportunity to spur the legislative process, but he also bashes Congress and thereby reduces his chances of achieving consensus in the future. President Obama wants to win re-election, and he and his advisers know that he needs money to achieve that goal. I understand why he’s doing what he’s doing. Still, I can’t help but think that it would be better for the country — and for President Obama, too — if he spent less time at black tie galas and more time with Senators and Representatives, slapping backs and twisting arms. Our election campaigns are so awash in cash and our politicians are so trained to engage in incessant, mindless fundraising that seemingly nothing is off-limits, no matter how silly or classless. Witness President Obama’s recent videotaped message offering his supporters a chance to participate in a raffle for a chance to have dinner with the President and Vice President Biden. The message, which was filmed somewhere in the White House and emailed to millions of people, was accompanied by a form offering supporters the chance to check boxes making donations of between $5 and $700 for a chance to win the dinner. There are arguments about whether or not the raffle constitutes “fundraising,” and if so whether the appeal was improper because it was filmed in the White House. I don’t know enough about campaign finance law to opine on such issues, but I do feel strongly that the appeal cheapens both the Office of the Presidency and the White House. Our President’s time should not be raffled off like it is a weekend at a Hilton Head condo or a hot air balloon ride. And although other Presidents apparently have used the White House, to varying degrees, for fundraising purposes, can’t we all agree that one of the most historic and venerated buildings in the land should not be used like a cheap backdrop in the eternal quest for cash? The amount of money raised in political campaign is obscene. Candidates from both parties don’t seem to have trouble raising money by giving speeches, attending political dinners, and appearing at standard-issue fundraisers. President Obama’s 2012 campaign fundraising goal is somewhere above $750 million, and some are saying he will raise $1 billion. Given his proven ability to raise huge amounts of money the old-fashioned way, why must we stoop to tawdry raffles and similar fundraising gimmicks that make our President look foolish? As I noted recently, the President has been on a three-day bender of fundraising and campaigning, sufficiently leavened with “non-political” events to justify the taxpayers picking up most of the tab for the trip. Monday night he was in Los Angeles to attend an upscale fundraiser at a Hollywood producer’s house that netted a cool $1 million. That nice pot of cash came at a price, however. Because the President traveled to the producer’s home by motorcade, the Secret Service had to close down roads that just happened to be some of the major arteries in the L.A. area. Traffic ground to a halt and commuters were trapped in seemingly endless gridlock. As the Los Angeles Times reports, virtually everyone who was unfortunate enough to be on the road at that time — regardless of their political affiliation — was furious at the President and his insensitivity to the impact he was having on their lives. So President Obama came away from L.A. with lots of money but lots of bad feeling from voters, too. His apparent lack of awareness of the fact that he was inconveniencing thousands of people just so he could attend a political event may end up being one of those little incidents, insignificant in its own right, that nevertheless accumulates in peoples’ minds until the balance gets tipped in one direction or the other. President Obama and the First Lady already are being criticized for their vacations and lavish lifestyles. A fundraising visit that mires thousands of tired commuters in a frustrating, unmoving hell of hot asphalt and exhaust fumes may well contribute to the President’s growing reputation as an elitist who doesn’t really understand average Americans or their lives. If that reputation gets fixed in the minds of voters, it will be awfully difficult to change.